It used to be so simple: for a 1920’s-themed party, or for those who’d inherited an 18th century French Château, the ‘coup’ or saucer-shaped glass was perfect for Champagne, even if the legend that it was modelled on the breast of Marie Antoinette is a complete myth. For those more serious about enjoying Champagne only a tall, slender ‘flute’ that would enhance the sparkle of the wine would do. But that was then, in an age before glassware companies like Riedel of Austria launched ranges of very specific glasses to suit every type of wine: not just white, red or sparkling, but glasses to match specific grape varieties, specific wine regional styles, even wines of different quality levels. The whole world of glassware has changed, perhaps most significantly of all in the appreciation of Champagne as a fine wine in its own right. 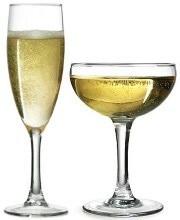 Today, a plethora of Champagne glass shapes is available. One definite trend has been a move away from the thin, upright flute, to a version that is more generously sized, with greater girth around the middle of the bowl. In many ways it is more like a standard wine glass, which reflects an approach to the best Champagnes as wines to be savoured, rather than sloshed. But there are crucial differences between glasses for Champagne and for still wines, not least of which is the ‘nucleation point’. Though not present in all Champagne glasses, and to be honest, probably only in the finer, more expensive ranges, the nucleation point is a tiny imperfection deliberately placed at the very bottom of the bowl, above the stem. It’s all about the bubbles you see, 20,000 of which scientists have measured in a single glass of Champagne. 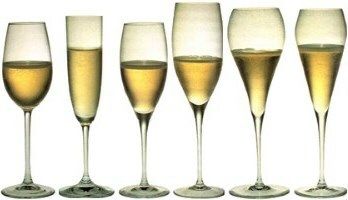 Super-clean glasses are not terribly good at creating the conditions for bubbles, so a nucleation point can be added: one or more finely etched ‘scratches’ in the glass that aid the formation and persistence of bubbles, one of the essential elements that makes sparkling wines so appealing. I know one Champagne cellarmaster who carries a small glass engraving tool everywhere he conducts a tasting, and gives every glass a scratch or two before he commences. And then we come to the style of Champagne to be drunk. Some very serious Champagne aficionados that I know have taken their glassware OCD to new levels, with sets of a dozen different glasses, used depending on whether the Champagne is vintage or non-vintage, white or rosé, dry or more sweet, young or mature, and so on and so on. I am a huge lover of Champagne – indeed I’m on record as declaring it as my ‘desert island wine’. Having come to really appreciate the ‘new flute’ shapes – much bigger and wider – I was in the market for a new set of dedicated glasses. I’m not at the level of dedication that demands a different Champagne glass for every style, so was looking for a great ‘all-rounder’ that was able to enhance my enjoyment of vintage or non-vintage, white or rosé, and all of those variations on the Champagne theme. I sought advice and information from some of my more fizz-obsessive friends who frequent the wine-pages forum, and whilst, predictably, this resulted in a fabulously diverse range of opinions, after a process of elimination I have found what is, for me, an ideal glass. It’s part of Riedel’s ‘Veritas’ range, made from machine-blown crystal. Light and yet substantial at 235mm tall, they also have a nucleation point. They are not cheap at around £55 a pair, no doubt a price some will consider OTT. Much cheaper glasses of broadly similar shape are available, but the best Champagnes are among the world’s very best wines, and I think they deserve a glass of similar quality. So far, I’ve been delighted with the performance on a range of sparkling wines, including a 1996 Pol Roger Winston Churchill, a recently disgorged Charles Heidsieck non-vintage and a Brut Franciacorta from Bella Vista. Is it the ultimate glass? Who knows, but it fits the bill as a great all-rounder in my book.